The Nagarattars of Tamilnadu in South India have a unique tradition which follows the ceremonial tying of the Mangalsutra or Thali. The fathers of both the bride as well as the groom sign the Isaivu Padimaanam, which is basically a document stating the marriage as a contract between the two families. 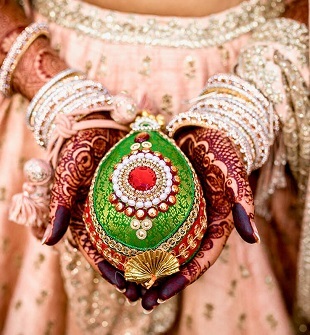 An Indian bride in a Wedding usually applies Mehendi or henna to her hands and feet before her wedding. The belief is that the deeper the final color of the mehndi, the more she will be loved by her husband or some say, by her mother‐in‐law. She is also further forbidden from doing any household chores as long as the color of the bridal mehndi remains on her hands, making the longevity of the Mehendi all the more desirable and exciting! 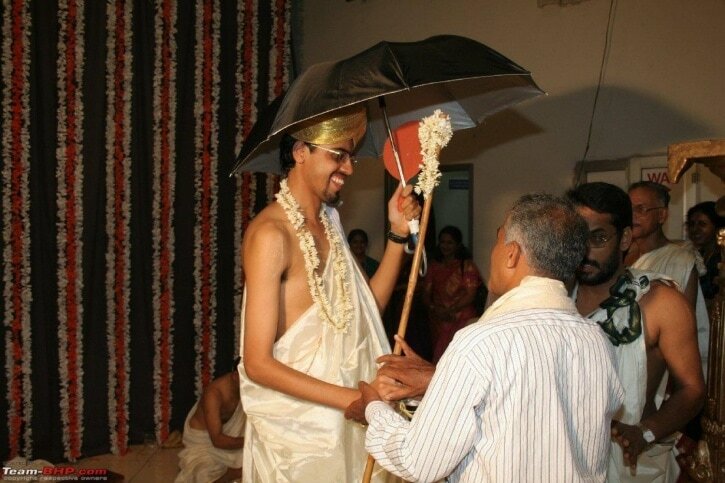 Grooms, as observed amongst Tamil Brahmins perform a kind ritual enactment of asceticism. The practice during the wedding is for the groom to pretend as to being suddenly disillusioned and wanting to renounce the world. He is accompanied by his friends, and he leaves the marriage hall dressed in a dhoti (a simple small piece of cloth tied at the waist with a knot). The father and other relatives of the bride are then ought to persuade him to come back and accept the bride for marriage. It is observed amongst some of the ancient Indian tribes, marriage by abduction is the most common norm. The young man must carry away his lady on his back, and then he has to keep her hidden for a year and then have a formal ceremony with the automatic consent of the bride’s parents, upon the successful completion of the practice. Some of the tribal communities in India weddings perform an earth‐bringing ceremony before the wedding. Earth from a holy place is carried to the wedding house and a kiln is built and carefully anointed. All the food for the wedding feast is to be cooked in this kiln. Recommended Post: Intercaste Marriages: What is the Big Deal? In the North Indian weddings, the groom’s face is kept hidden before the wedding behind a floral veil, which is also commonly known as Sehra and is tied to the turban. The veil is supposedly believed to protect him from any sort of evil eye. During a particular point of time before the ceremony, someone from the bride’s family lifts the veil to ensure that the groom is the chosen one and not merely an impostor! 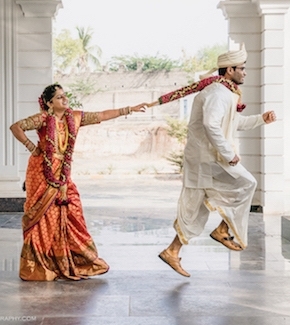 After the successful completion of a Hindu Indian wedding ceremony, the bride arrives at her husband’s home and is ceremonially ushered inside the house by her mother‐in‐law. 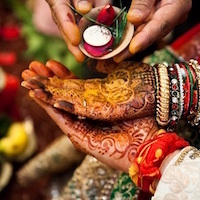 The bride must then take care to enter the threshold with her right foot first, which she uses usually have to do by gently knocking a vessel filled to the brim with rice, placed there strategically in order to ensure that good luck and plenty of prosperity will be brought by her for her new family. Another light‐hearted ritual called Aeki Beki which is most commonly seen amongst the Gujarati Hindus, who follows the arrival of the newlywed couple at their home. A ring along with a few coins are put into a silver dish filled with milk, sometimes even rose petals and vermilion and the bride and groom are asked to dip their respective hands into the bowl to search for the ring. The one who supposedly finds the ring four out of seven times is predicted to b most likely to rule the marriage! Please share your views on the article in the comment section. Cheers!